In Harley Quinn #17, our hero takes on an insidious threat, after squashing an alien invasion in her previous story arc. Co-writers Amanda Conner and Jimmy Palmiotti have been laying the seeds for this dark storyline for several issues. And Harley Quinn fans will be very excited to see the buildup pay off. The mayor of Brooklyn has enacted a plan to deal with the city’s homelessness problem. The homeless are being rounded up, killed and fed to the rich. This incredibly disturbing initiative comes to the attention of Harley’s ally, the chief of police. 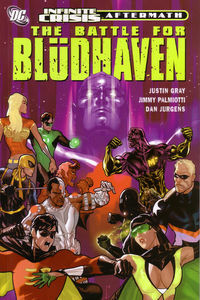 And he asks Harley and her ragtag group of antiheroes to look into the disappearances. Harley and her group plan a sting operation to go undercover. The result of Harley posing as a homeless person ends up in beat down on some thugs who are really asking for it. However, by the comic’’s end Harley gets a taste of what’s really going on. And that leaves our beloved heroine in a precarious situation. But one of the big standouts of this issue is the backup story scripted by Palmiotti and Harley Quinn co-creator Paul Dini. It’s a flashback to Harley and Joker in happier times. It also invokes the classic Batman: The Animated Series art style. This is a fun, fast-paced story that gives us a window into the domestic life of Harley and Mr. J. Seeing Harley return to her animated series origins, and particularly from the pen of the man who gave her life, is a major thrill for fans on the 25th anniversary of the series. Harley Quinn was created to be The Joker’s girlfriend. As comics readers know, she has become so much more than that over the years. She’s developed into a fiercely independent and beloved antihero. So, it creates an interesting dynamic in Harley Quinn #11 when The Joker enters Harley’s life again. After multiple teases in the last few issues, the Clown Prince of Crime himself shows up in Harley’s apartment. He says he just wants to talk. Knowing The Joker there’s probably more going on than what he’s saying. Harley wants nothing to do with him and Harley’s friend Red Tool (who’s not so secretly in love with her) is even less excited by the visit from Joker. The Joker’s return is obviously going to form the backbone of the next arc in the book. But it is merely a prologue and epilogue in this issue. The majority of the story involves Harley and Red Tool breaking into an underground labyrinth of tunnels and taking on a giant blob monster. It’s a good thing Harley brought so many grenades. There are also the beginnings of a political intrigue subplot involving a nefarious mayor enacting an unethical plot to deal with his city’s homeless problem. LikeThe Joker story, this feels like writers Amanda Conner and Jimmy Palmiotti planting the seeds for something big down the road. Under the creative control of Conner and Palmiotti, Harley Quinn has become a vibrant madcap book that perfectly fits with its titular heroine. 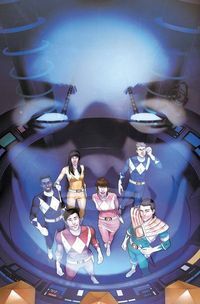 This issue shows that the creators have lots of ideas to keep this book going for the foreseeable future. A lot of the credit goes artist John Timms as well. His pencils sync up perfectly with the lunacy of the scripts and helps give the book a zippy pacing. DC fans will have to wait to see how this all turns out. But they should have faith that this is a creative team that’s got the goods to live up to expectations. Every Wednesday, we pick a few of this week’s new releases that stood out from the crowd for our ongoing New Comic Book Day blog series. 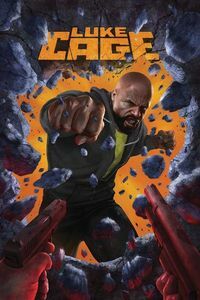 Check out our reviews of some of this week’s best comics below and be sure to comment below or share our post on Facebook or Twitter if you like our reviews! Holy cannoli! 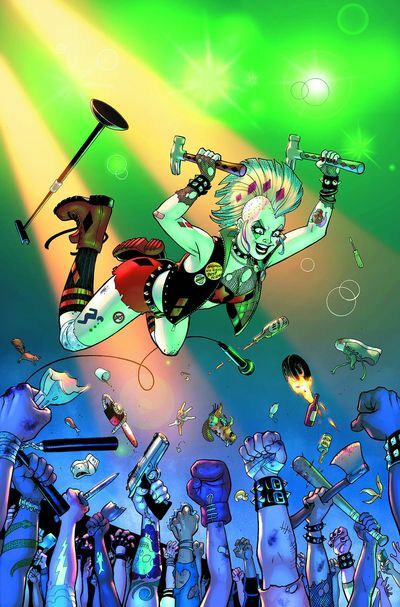 Amanda Connor and Jimmy Palmiotti never fail to show us a new side of Harley Quinn. This issue kicks off with Harley being robbed of her personal property from Arkham. She isn’t the only one being robbed and since the cops can’t (or won’t) catch the perps, it’s up to our lovable wild card to take them down! JOIN HARLEY’S ONGOING ADVENTURES TODAY! 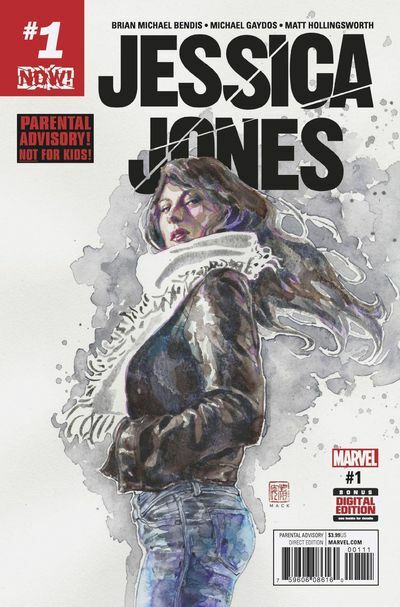 After the success of her Netflix series, it was only a matter of time before Jessica Jones made her way back to her own solo book. Brian Michael Bendis and Michael Gaydos are back together in this new series with the same tone and grit as their original, Alias. Be warned, Marvel is serious with that parental advisory on the cover. This one’s not an all ages book at all. The language is salty and there is a definite vibe throughout that things will get worse for Jessica long before they get better. I never thought I’d see the day when two separate characters from John Carpenter’s filmography would come together, let alone characters played by the same person — Kurt Russel. 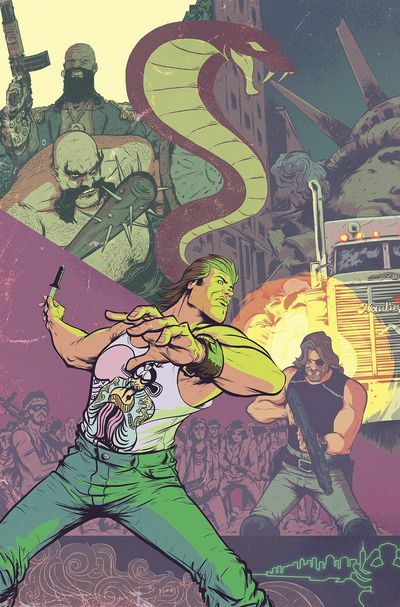 With Boom Studios holding the comic rights to both Big Trouble in Little China and Escape From New York, it was inevitable — and I’m so glad it happened. The premise is pretty simple, in the world of Escape From New York, the year 2001, someone uses a magical object to bring “Snake Plisskin” across the country to help aid in a mission. Except it’s misread and instead brings good Ol’ Jack Burton from Big Trouble in Little China’s universe (and 1987 for that matter). A new story arc spinning out of the aftermath of Doctor Strange’s battle with Empirikul sees that almost all magic on Earth is gone. 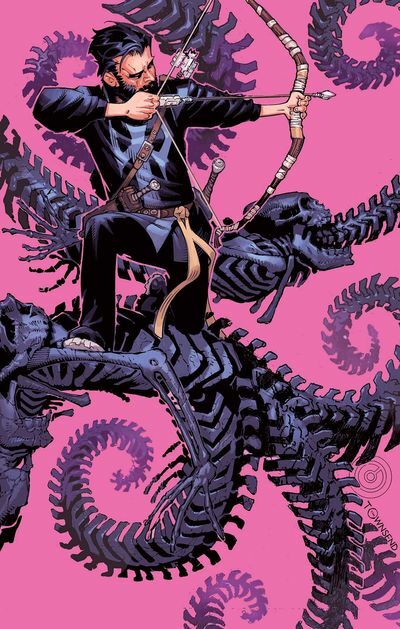 Because he’s now severely limited in magic power, Strange is left to rely on his massive arsenal of magical items and weapons to combat the mystical threats. Now that he’s at his weakest, Baron Mordo, who still seems to be fully powered, is making his move against Strange, who may or may not have been led to the arms of a very unlikely ally. What did you think of these books? Have you been anxiously awaiting the Big Trouble in Little China / Escape From New York crossover as much as we have? Let us know below! We’re pretty excited about the crop of New Comic Book Day picks from this week’s new releases. Check out our other blog articles so see our thoughts on other books. Be sure to comment or share our post on Facebook or Twitter if you like our articles! From our universe to theirs. 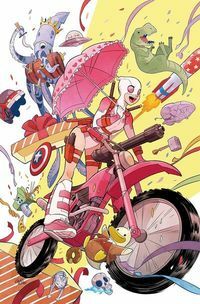 Gwenpool is all about this superhero/mercenary game. We don’t know how she got here but all we know is she’s from our world. Yeah, ours. She’s read the comics watched the movies, played the games. Somehow she ended up in the 616. She’s been having small gigs with Howard the Duck but now we get an ongoing with her. It’s funny, crazy, and full of nonsense that, if you knew you was in a comic you would probably do as well. 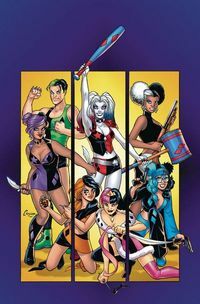 If you are a major Harley Quinn fan, Harley Quinn and Her Gang of Harleys is the comic book miniseries for you! Harley needs some help so she calls together a band of friends to fight crime. Most of these characters are familiar to you if you read the on going Harley series. If you are not familiar with it, that’s okay! 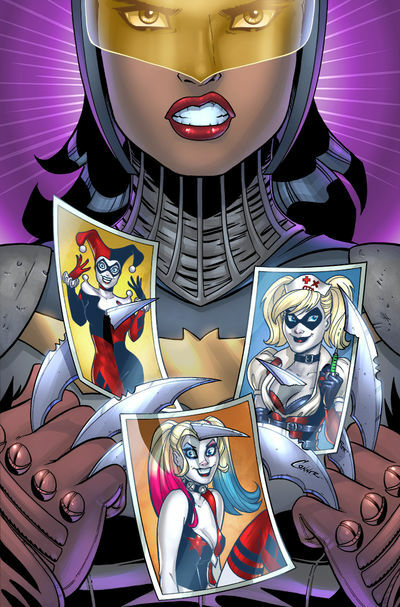 This number one breaks down who each new Harley is and what their special ability is. 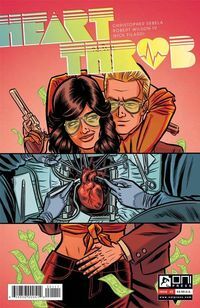 Writer Christopher Sebela and artist Robert Wilson IV have an interesting idea on their hands with this first issue of Heartthrob. A young woman, Callie, gets a heart transplant and with that transplant, Callie starts to not only “see” her heart donor in her minds eye, but starts to have romantic feelings towards her donor’s “ghost” (for lack of a better term). And what could be stranger than that but to have that “ghost” have feelings for Callie too? This is a welcome turn for Callie who is consistently having her advances towards her living lover/co-worker spurned. Meanwhile, Callie finds out that the company she’s been working for is a little less than honest. Another awesome Dragon Con interview! Here we have a two-part interview with the very gregarious Jimmy Palmiotti, writer of Power Girl, Jonah Hex, Time Bomb, and the Supergirl story for Wednesday Comics, among others. Jimmy tells us what it’s like collaborating with his wife, artist Amanda Conner, and how he’s able to write across the superhero, Western, and supernatural genres! WonderCon: Jimmy Palmiotti Interview & Win a Signed TPB! WonderCon 2010: Jimmy Palmiotti Interview! While at WonderCon 2010, Andrew met up with writer Jimmy Palmiotti (Power Girl, Jonah Hex), who graciously agreed to take part in one of our Choose Your Own Adventure interviews! Below, Palmiotti reveals who leaves him starstruck (hint: a very close co-worker) and talks about his upcoming comic with Image, Random Acts of Violence! If you love Jimmy Palmiotti like we do, you’ll be extra psyched to hear about this week’s raffle item: a signed copy of Infinite Crisis Aftermath: The Battle for Bludhaven, signed by Palmiotti himself! You can either sign up for our newsletter to be eligible, or head to one of our three Oregon locations and receive a raffle ticket with purchase!